We frequently find ourselves facing decisions about pressing and important matters with less than ideal knowledge concerning relevant background information, possible outcomes, and contributing influences. We often have to make the decision, but without the resources or time to gather the information we would need to be sure it's the right one. We make decisions under uncertainty whenever we treat illness, make an investment, plan for retirement, drive home from work, or buy a bagel. Some of these decisions involve serious outcomes that will have big impacts on our lives if we choose poorly. In others the worst case scenario for a poor decision is trivial. It stands to reason that the resources—time, money, energy, thought—we invest into making a decision should be proportional to its importance. It is as irrational to deliberate for more than a few seconds about the optimal place to sit on the bus as it is to get married on the strength of a perfect first date. Our sense of the importance of our decisions is captured in what economists call the expected value of our actions. 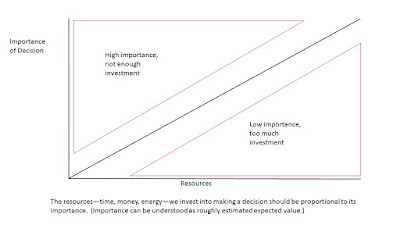 This chart represents the ideal, linear relationship between the resources we should put into a decision and its relative importance. As the importance of a decision goes up, so should the resources we put into making it. The mistakes above and below the line deserve some specific analyses and strategies. 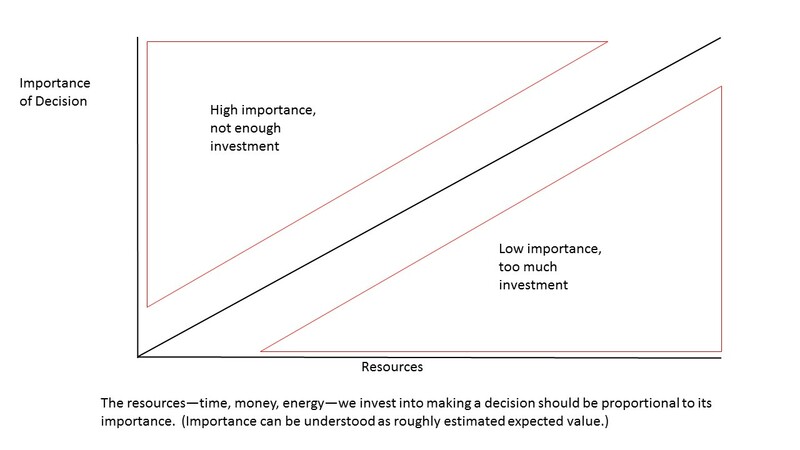 The triangle on the bottom right represents all the cases where we invest more resources into making a decision than its relative importance warrants. You spend twenty minutes agonizing over which frozen yogurt flavor to get; you go buy bug spray and spend extra time applying it and warning everyone about the dangers of Zika virus; you avoid a potentially fun camping trip because you’re worried about serial killers. What’s the harm in these cases? We waste valuable time, energy, and thought on some decision that won’t make a commensurate level of contribution, positive or negative, to our lives. Economists define the value of a particular outcome as the probability of that outcome multiplied by its utility. Sometimes the outcomes we waste energy worrying about are unimportant because their utility is very low: You would have been just as happy with the chocolate velvet cake frozen yogurt as you would have been with the strawberry tart, but you thought about it, talked about it, and dedicated time and mental resources to it as if the wrong decision would be dire. You acted like your efforts to decide would make a real difference to your future self. Alternatively, the outcomes can have low importance because their probability is vanishingly small: the combined odds of getting the Zika virus, being pregnant, and having birth defects are astronomically low. Now let’s consider the other class of mistakes, above and to the left of the ideal range. These are cases where the decision involves a matter of higher relative importance, but we didn’t give it the appropriate amount of attention before deciding. We shotgunned a decision, with too little information; we decdided while the jury was still out deliberating. These are decisions that are impulsive, hasty, or inattentive. We failed to see that considerations of utility and probability gave this case a high expected value. You tossed aside that envelope from the DMV with a warning about the fine on your late registration going up $200. You floored it when the light turned yellow and then red at the busy intersection. You left your bike unlocked in front of the Starbucks because you were just running in for a second. You got caught up in a false sense of scarcity in the last minutes of an Ebay auction and paid more money for an item than it costs on Amazon new. Your positive feelings about the friendly and attractive car salesman make you more positively inclined to sign the loan papers and you end up payments you can't afford. What’s going on in these cases? Generally, as the amount of relevant and valuable information declines, so does the quality of the decision. Poor quality decisions result in a higher error rate. We might not get it wrong, but we are more likely to. And in important matters, a wrong decision has more disastrous consequences. So in these cases, we disengaged from the analysis and information gathering phase of the decision process too soon. We decided before information that could have led to a better, lower error rate decision might have come to light. More reflection about the probabilities, or about the utility would have elevating our estimate of the expected value. What should we do in these cases? Slow down, focus, and engage more of what Daniel Kahneman calls System 2 faculties. Consider the dire consequences a decision made in haste might have. Reflect on the risk and utility of the outcomes and put the appropriate amount of resources into the decision. With every decision we make in life comes a decision about how to decide, one we often make badly without realizing it. Learning to apportion our decision-making resources to the problems that really matter is a big step toward getting more of them right. Cool post Matt. This is basically triage made personal. (1) Failure to commit some resources to deciding how to decide means that we will typically spend way too much time on trivial decisions, and not enough on the important ones. After all, the former vastly outnumber the latter. (2) The more time we spend working out a decision the more important it seems to us. Obviously there is a sunk cost issue, but the cogntive dissonance issue here is extremely important too: This decision can't be trivial. It it were, I'd be a fool for having just spent so much time on it. And I'm not a fool. I suppose one concern I have here, though, is that the initial sizing up of the importance of decisions is just not an easy tasks. All sorts of biases will inhibit us from doing it effectively. I know, e.g., that when I am in that mode I am looking specifically for reasons to treat a decision as trivial simply because I don't like it. This is especially true when I'm having to deal with other people's problems. I am constantly having to stop myself from saying that they are trivial, because they are trivial to me, but not to them. Sometimes, too, we just enjoy the decision-making process. For example, deciding which of two great destinations to go to on a vacation. Your reasoning really applies to this as well. But deciding is part of the fun. I’m fully on board with this, Matt, in some moods. In others, though, I worry about the way some use the findings of behavioral economics to make judgments about the relative importance of different decisions from the outside. Because whether or not, e.g., someone’s ignorance about something is rational -- because ignorance economizes on search costs -- depends on the preferences of that person. Coincidentally, my 103 quiz this week asks this (as a survey question). I’ll let you know what they say. You go to a food mall where there are many vendors selling cheeseburgers. You buy a cheeseburger from one of the first vendors you see for $8. If you had engaged in a longer search among the many vendors, you could have found a qualitatively identical cheeseburger to buy for $5. No force, fraud or deception has influenced your purchase. Which of the following is it most appropriate to think? a. The market for cheeseburgers here is unjust because the decision to buy the $8 cheeseburger wasn't fully voluntary. This market is also imperfect/inefficient because the decision to buy the $8 cheeseburger was based on incomplete information. b. The market for cheeseburgers here is unjust because the decision to buy the $8 cheeseburger wasn't fully voluntary. However, it's still efficient, because the decision to buy the $8 cheeseburger suggests the buyer’s indifference between spending $3 extra and avoiding the cost of searching for the $5 cheeseburger. c. The market for cheeseburgers here is just, because there is no force, fraud or coercion, but imperfect/inefficient, because the decision to buy the $8 cheeseburger was based on incomplete information. d. The market for cheeseburgers here is just, because there is no force, fraud or coercion, and also efficient, because the decision to buy the $8 cheeseburger suggests the buyer’s indifference between spending $3 extra and avoiding the cost of searching for the $5 cheeseburger. Kyle your example reminds me of anecdotes I used to here after the collapse of the Soviet Union made it possible for more people who had lived under communism to immigrate here. The story was that they would choose a different option entirely: the market is unjust because it permits exactly the same product to be given totally different prices!